Balidriver's name is Putu Liong. Putu has been a 'Balidriver' for over 10 years. 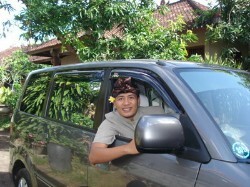 He is born and raised on Bali and he will show you the best places, views and attractions on the island. Putu is married and has a son and two daughters. He comes from the Besakih area (Mount Agung and the Mother Temple). With his family he lives in Den Pasar. Balidriver.nl is Putu's own company and his policy is to provide you the best and most reliable service. Safety is paramount and Putu keeps his skills updated with regular courses to comply fully to regulations. Putu carries all documents in the car at all times and will show you upon request. Putu of course offers every touristic excursion that you can find in any of the catalogues. Next to that he is open to any adventure that you may have in mind; he can help you put together your own travelplan, make bookings for you and even accompany you on multi-day trips. Putu's excursions start from 25 euro. For exchange rates please check: www.exchangesrates.com. Is it your first time on Bali? Ask Putu to arrange an introduction trip for you. Guaranteed that you will have really seen Bali and that you have learned much about Balinese culture, the people, the arts and crafts and the delicious food! Putu has many contacts and good repore on the island, which enables him to book fun arrangements for you, like whitewater rafting or dolphin-watching at Lovina for very reasonable prices. Have you decided to explore Bali with Putu? Then you have opted for clarity and security! With Putu you agree upfront what exactly you want to do on the island and what it is going to cost. Putu will give you clear information and you will not expirience unpleasant suprises. On the agreed day and time Putu will pick you up at your hotel and your adventure can begin.